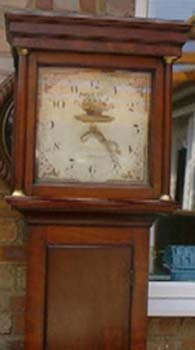 A mahogany 30 hour Longcase clock, rope driven movement in excellent original condition. A very attractive painted dial with roses to the corners and a basket of flowers above the centre. W Strickland of Tenterden is listed in Brian Looms "Clockmakers of the world" as working circa 1802.